Summer is here!! I know it's mid August and the rest of you have been suffering with sweltering, sultry temperatures for the last few weeks, but here in San Diego we are finally getting a touch of summerlike weather. The sun is shining, (although it didn't show itself until 10 AM), it's above 72º and I'm finally warm. I can still see that gray marine layer off the coast, but I'm absolutely ignoring it and pretending it's not there. Summer makes me want toss together flavorful ingredients for lighter, fresh sides. Angie, of Angie's Recipes, provided the perfect salad for our hello to summer dinner. A light, absolutely refreshing salad using our coveted heirloom tomatoes and tossed with peppery arugula in a tasty vinaigrette perfectly describes her Tomato Onion Salad. I discovered this salad about a week ago and have already made it twice with raving reviews both times. The ease of tossing the salad together and adding the vinaigrette at the last minute added to my love of this dish. A few shakes of a small jar combined the dressing ingredients quickly and easily with the garlic adding another element to the depth to the flavors. Amazing how such a small amount of this fragrant herb can work such wonders! Thanks Angie for an excellent salad!! This will be one of those recipes that I look back 10 years from now and say "Ah.... I remember the first time I made that salad! It was the beginning of summer ~ 2010." So join me in raising my glass (well... actually my fork) in welcoming our long lost summer. May he see fit to return tomorrow! Mix salad ingredients together in a medium bowl. 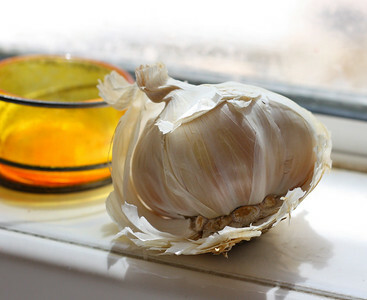 Add vinaigrette ingredients to a small jar with a tight fitting lid and shake vigorously until combined. Add vinaigrette to salad and toss lightly. Top with a sprinkle of feta. Enjoy! one of my favorites! I will definitely give your version a try. Great job! Thanks Pure Mama! I hope you like this one too... It's my current obsession. Juliana, thanks! I totally forgot to take a picture of the end product... ah well! My favorite kind of salad! At least the salad feels like summer even if the weather in California feels like early spring! Hi Kim, thanks for stopping by my site the other day. Glad you liked the pasta dish. Its funny how kids sometimes like very grown-up tasting stuff (gorgonzola brie huh!). Salad sounds great. I am a salad fanatic myself. Next time I feel like a salad I will definitely try this combo out. You can keep the sun. I don't want it in LA right now. Ew. And this is one of my fav kinds of salads (minus mustard). BTW, LOVE that your dad mentioned my blog! My mom will look at the blogs of people who leave me comments and then be like "Did you see what ____ made?" And then she gets all fascinated with other peoples' blogs. All these wonderful tomato salsas make me feel like I've won the lottery! This looks fantastic. I love trying them all and can't wait to include this one. Thanks! That salad sounds delicious!! I can't seem to get enough of tomatoes this summer, here in new england we've had the perfect summer weather for growing them! Thanks for sharing!!! 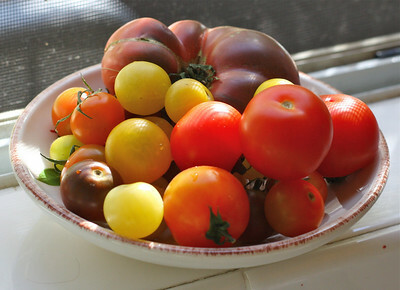 If you can't grow your own tomatoes there's nothing like the sweetness of heirloom tomatoes. Great recipe and can't wait to try it. We still have an active farmers' market that sells BEAUTIFUL Heirlooms. Thanks for the recipe! Patty, early spring is a perfect description. Have to say I'm currently sitting in Palm Springs and 112º is a whole different story!! Baking Barrister, I have a completely different view on the sun in this Palm Springs Heat!! Mom Chef, I feel the same way! Kristy, thanks! I can't get enough either... Funny, 3 years ago I didn't really eat tomatoes, but now I can't stop. Lisa, thanks, I agree, with these ingredients you can't go wrong. BusyMom, I am so lucky to have a stand just down the road from my house! Ooh, those tomatoes are beautiful! My tomatoes have not fared well this year but fortunately I have a friend who is a Master Gardner and she gave me a bunch yesterday. Had BLTs for lunch and was planning on bruschetta tonite or a salad tonight - this would be perfect. I love the simplicity! Priscilla, my tomatoes this year have fared just about the same... luckily I have a stand right down the street and theirs are great! Gerard, I guess I didn't really realize that you were Down Under... hang in there, summer is coming!! I would love to use heirloom tomatoes too...sadly I just can't find them here. I might check the Turkish stores in the city next time. Angie, than you so much for the recipe!! This truly has become a favorite for our family, we are on vacation with a couple of other families these past few days, and this salad was on tonight's menu. A hit all the way around! I looove tomato salad, especially with onion and garlic and eat it with baguette like bruschetta.